There are only 35 days remaining until the 2012 Badwater Ultramarathon. That leaves a mere 4 full weeks of training before heading out to the desert. This year was the first year that we headed out to Death Valley in June, for a 3-day training camp. Badwater veterans Chris Roman and Cheryl Zwarkowski joined for the adventure, and we even saw Frank McKinney – he was hosting a “Conquering Your Life’s Badwaters” event. The amazing Ben Jones came to see us on Day #1, crewing us for over 20 miles and taking a ton of pictures. Going forward, the hope is to put in 3 more high-mileage weeks and a mid-range week, before taking it easy for the week before the race. 6:42 AM – 13.00 miles in 2:05:19 (9:38 pace) at Rockefeller State Park. Return of the humidity. Today was difficult as it followed 3 days of high mileage – 21.7, 34 and 24.8 – long runs. The ultimate goal was to hit 18 miles, but it just wasn’t the day for it. 5:10 AM – 3.10 miles in 26:02 (8:23 pace) on neighborhood roads. 9:38 AM – 20.60 miles in 4:31:02 (13:10 pace). Crewed by the great Ben Jones, Day #1 of Death Valley Training Camp consisted of a run from Badwater Basin, the start of the Badwater Ultramarathon, to Furnace Creek. Along the way we detoured to Artist’s Drive, a 9-mile horseshoe type loop with a steep ascent. The temperature hit about 118 degrees. 10:03 AM – 13.00 miles in 2:23:12 (11:01 pace). Day #2 of Death Valley Training Camp was a run on a portion of the Badwater Ultramarathon course that, for me, is typically a long, arduous walk. 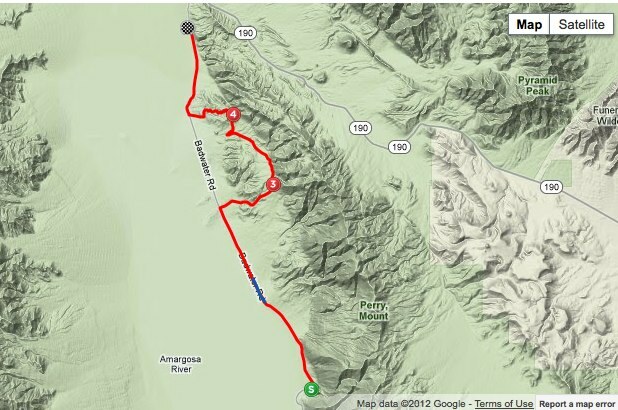 We covered miles 41.9 to 58.7 – a 4,956 foot climb from Stovepipe Wells to Towne Pass. We used Cheryl’s car as a moving aid station, and without a fourth person to drive it we had to get creative, alternating 2 mile drives between the three of us. Temperatures started in the mid 100s, then dipped to the mid 90s as we made the ascent of Towne Pass. 8:33 AM – 10.00 miles in 1:57:45 (11:46 pace). 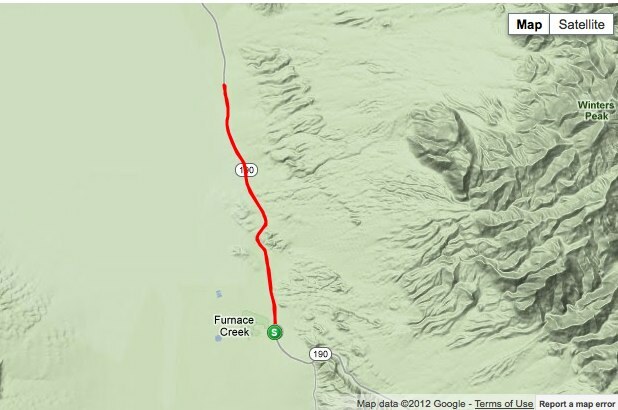 Day #3, the last day of Death Valley Training Camp, was a simple out-and-back run starting at Furnace Creek. Not wanting to use a vehicle, the three of us donned packs and headed toward Stovepipe Wells for a short 5 miles. Turning around we hit a 35 mph headwind that was a killer. Temperatures were in the low 100s. 11:13 AM – 3.20 miles in 27:53 (8:42 pace) at Rockefeller State Park. 1:30 PM – 1 hour of strength training. 4:55 AM – Stationary Bike 30 minutes. 5:21 AM – 6.10 miles in 57:30 (9:25 pace) on local roads. 6:50 AM – 1 hour strength training. 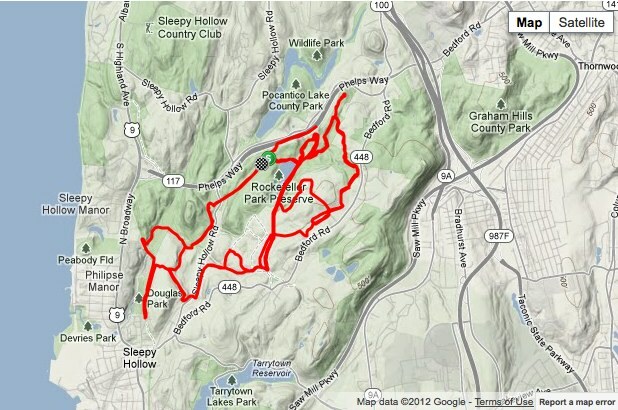 7:03 AM – 13.50 miles in 2:06:18 (9:21 pace) at Rockefeller State Park. 6:23 AM – 20.00 miles in 3:29:20 (10:28 pace) Rockefeller State Park. After a good paced 9.50 miles, I met Cherie and 5 members of her New York City running group for the remainder of the run. Lots of fun on another humid, 80-degree day.